The Quaker Green Fund (QGF) is a balanced and diversified fund that is “fossil fuel free” and is specifically designed for Friends meetings, churches, and organizations. The fund adheres to FFC’s Quaker values investment guidelines. Our active shareholder advocacy work includes the companies in this fund, as well as those in FFC’s other fund options. Investors may hold units of QGF and any other Friends Fiduciary fund in a single account. 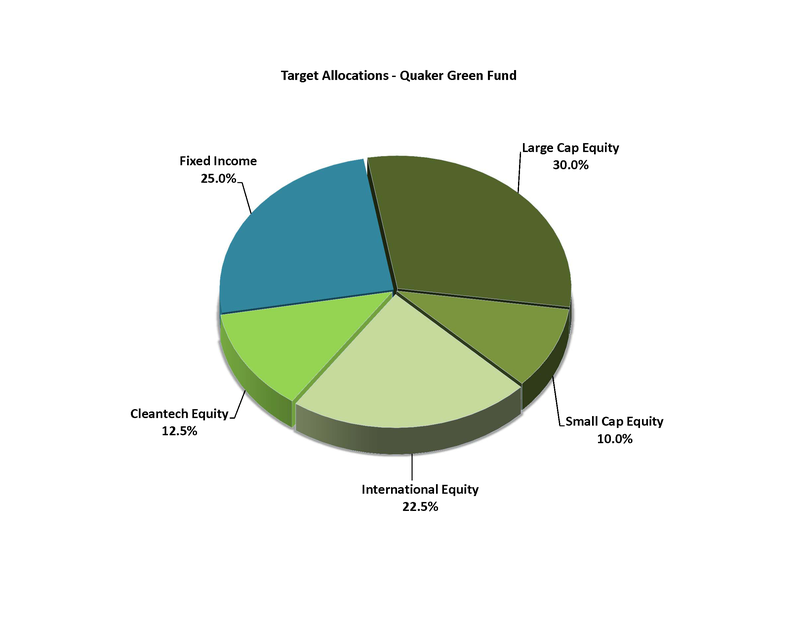 In addition to being fossil fuel free, the Quaker Green Fund includes a dedicated allocation to “cleantech/alternative energy” companies . These cleantech investments are in nine positive environmental areas. Areas include advancements in sustainable use of agricultural resources, alternative and renewable energy, efficient transport, power technology, water conservation and filtration, environmental finance, and cutting-edge clean technologies. This approach provides exposure to the interconnected segments of clean energy and clean technology while providing diversification to manage the overall risk profile and volatility of the fund. It is intended for investors with an investment horizon greater than five years. The Fund’s expense ratio is 0.90% (or 90 basis points), which includes all investment management and administrative fees. QGF operates with a semi-annual standard distribution rate of 3.5% paid in June and December. The standard distribution rate is reviewed annually by the FFC Board of Directors and reflects our outlook on long-term capital market returns and inflation, and it takes into consideration the fund’s unique asset mix and expected volatility. The rate is set at a level to balance current distributions with preservation of principal over time. The standard distribution rate is intended only as a guideline for constituents who have invested their funds with FFC and constituents may, and some do, take more or less than the announced standard distribution rate. For more information or to invest in the Quaker Green Fund, please contact Friends Fiduciary at 215-241-7272 or info@friendsfiduciary.org. Quaker Green Fund unit value is net of operating expenses and a daily income accrual factor for the Fund’s semi-annual distributions. 2Quaker Green Fund Benchmark: 30% S&P 500, 10% Russell 2000, 22.5% MSCI EAFE Index, 12.5% MSCI World Index, 25% Barclays Aggregate Bond. Fees: The Quaker Green Fund currently operates with a flat annualized fee of 0.90% (90 basis points). The Quaker Green Fund invests in stocks and bonds through SEC registered, third-party advisory firms and, as such, is subject to various risks related to the capital markets and to firm specific risks associated with advisors to the fund. Portfolio construction, asset allocation and portfolio management practices may not deliver desired results. The market prices of domestic and international equity investments may fluctuate and may decline along with moves in the broader equity markets or due to economic, industry or company specific events. The fund’s cleantech investments may experience high relative stock market volatility due to the nature of their products, financing and government policies. International and emerging market investments are also subject to geopolitical risks, country specific economic events and adverse changes in currency values. The fund’s fixed income investments (i.e. notes and bonds) are subject to interest rate and credit risks. As interest rates rise, the value of fixed income investments will decline and may turn negative. Investment managers who work in an advisory capacity may not deliver investment results as anticipated. Investors in the fund could experience a decrease in the principal value of their investment or go through a period of underperformance relative to the benchmark.